We all face roadblocks from time to time, and they can prevent women from living the healthy lifestyle that they desire. As part of the POPSUGAR Insights 2014 Healthy Living Report, we asked women to share the roadblocks that are preventing them from leading a healthy lifestyle. 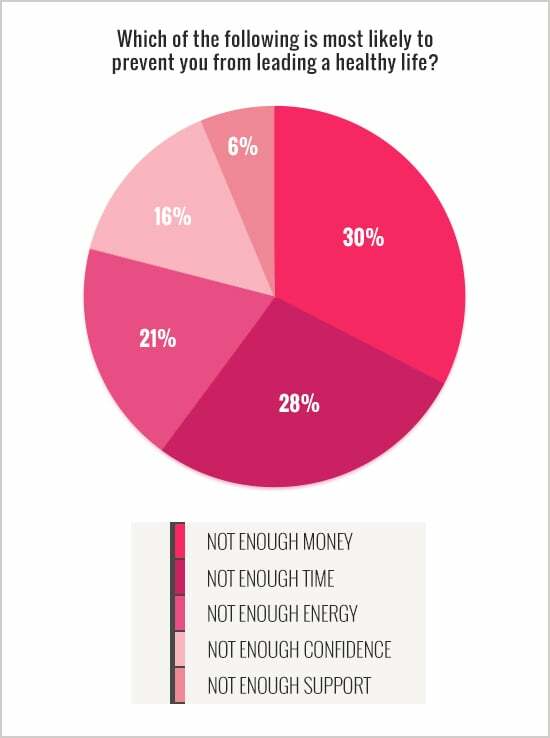 Overall, women cited “not enough money” as the No. 1 roadblock to preventing them from leading a healthy lifestyle. Not having enough “time” (28%) or “energy” (21%) ranked second and third, respectively, as time constraints in particular prohibit women from being able to keep up with the everyday exercise regimen they strive for. While marketers in some categories may not be able to help women overcome their financial challenges, all marketers can provide motivational messaging to help women make the most of what they have and achieve their healthy lifestyle goals. Additionally, roadblocks differ by age group. Women between the ages of 18 and 34 were more likely to cite a lack of time (31%), while women between the ages of 35 and 40 were more likely to cite a lack of money (41%) and lack of energy (25%). Moms were more likely to choose money (37%), while students were more likely to choose time (41%). Women from the Northeast and the Midwest ranked lack of time as the top roadblock, while women from the West and South ranked lack of money as the leading roadblock to living a healthy life. Savvy brands that offer products that help women achieve their healthy lifestyle goals should take note of these distinctions to offer solutions that are based on the primary need of their specific target audience.